A couple weeks ago, Donald Trump was chatting with Russia’s foreign minister about what a “nut job” James Comey is, when the president decided to let the Kremlin in on the hot new gossip about ISIS. Specifically, Trump decided to share intelligence that Israel had provided the United States — on the condition that it not be shared without Israeli permission — with the Russian government. More specifically, Trump disclosed the name of the city where the intelligence was gathered, information that Putin’s regime — a staunch ally of Israel’s bitter enemies in Tehran — could plausibly use to deduce the sources and methods that yielded the information. This did not please Israel. Nor did it sit well with intelligence professionals in D.C., several of whom proceeded to anonymously inform Washington Post reporters of what the gasbag-in-chief had done. Still, when Trump arrived in Jerusalem Monday, no one in the U.S. or Israeli government had publicly confirmed that he had spilled Israel’s beans. Best to retain official ambiguity, the two governments ostensibly reasoned, even if extensive reporting made Trump’s unauthorized disclosure difficult to deny. 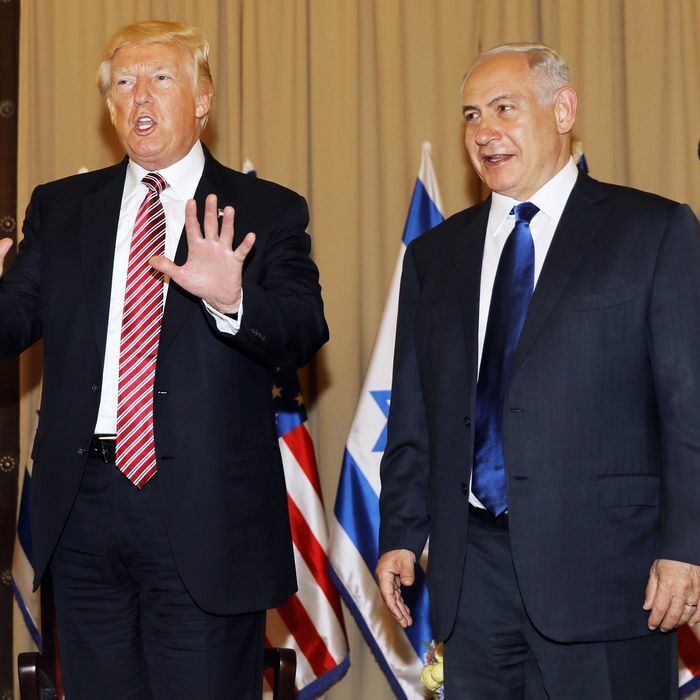 But then some Israeli journalists shouted questions about the matter at the end of a Trump-Netanyahu photo-op — and the president decided to defend himself by accidentally, implicitly confirming that he’d let Russia in on the Jewish state’s secrets. On Monday, the press gave Trump a chance to deny or ignore that report. Instead, he asked to be given credit for not blurting out the name, nationality, and GPS coordinates of the spy who gathered the details he’d divulged — and tacitly confirmed that he’d shared information of Israeli origin, in the process. Forty seconds into this video of the exchange, you can almost see Bibi Netanyahu wonder if the black guy who didn’t want a war with Iran might have been preferable to the meshuga schmuck standing beside him.